It’s something in short supply in today’s films, television and books. We as a culture of become cynically and intellectually lazy (not all of us mind, but that can-do spirit seems to have been diminished, flickering like a guttering candle), gone are the heady days of Mercury and Apollo when creativity, dreams and inspiration drove nations to strive for the stars; sacrificing what’s easy for what’s possible. Brad Bird’s latest effort wants to give some of that back to the world – showing that one person can affect change, can dream and make us better than we are. And I walked out of this film, feeling amazing… but I’m going to give a very general review because this one is best attended with minimal foreknowledge… No spoilers. George Clooney headlines the film, followed by Hugh Laurie, but this is Britt Robertson’s film, as Casey Newton, daughter of a NASA engineer (Tim McGraw) she embodies the modern-day dreamer seeking a brighter future and believing it can be possible. Given a mysterious pin (designed to commemorate the 1964 World’s Fair – I really want one!) she finds herself on the cusp of a life-changing adventure. 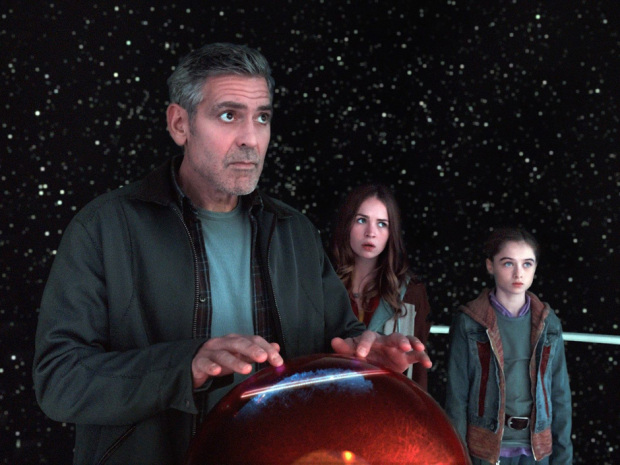 With the aid of Athena (Raffey Cassidy), she finds herself on the hunt for Frank Walker (Clooney), who can help her get to a futuristic world known as Tomorrowland. There are forces, however, led by Governor Nix (Hugh Laurie), that are less than keen to have Walker return to Tomorrowland. Add in the very real possibility that humanity is on the verge of completing its own destruction, and that Tomorrowland and Kasey may hold the key to saving it, and you have the ingredients for a fantastic adventure. An enjoyable mix of special effects, story and a truly important message provide a truly enjoyable two-hour family film, one filled with laughs, thrills and wonder. There’s also tons in there for my not-so-inner geek, especially in a tiny shop that plays an important plot point, there was so much memorabilia in there to know, recognize, and some I actually own. Clooney is mostly grouchy Clooney in this film but is still enjoyable (as always) but Robertson and Cassidy shine, both of whom symbolize the hope and dreams of the younger generation. I was completely caught up in the fun that this film wanted to create, and found myself responding very emotionally not only to the glimpses of our future, but also the film’s ending, which is undeniably hopeful, which isn’t giving away much, as I started the review with that word. Bird has become a favorite director, and to date hasn’t disappointed me. This one is definitely one for the family, and more importantly, you’ll all enjoy it, and more importantly, if you’re taking the kids, there is a lot of great things to talk about with them after the film is finished. Let’s talk after you see it!